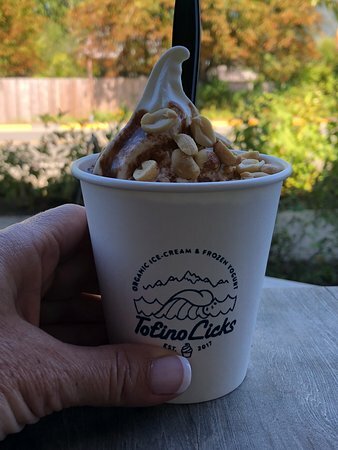 There aren't enough food, service, value or atmosphere ratings for Tofino Licks, Canada yet. Be one of the first to write a review! Enjoyed ice cream and frozen yoghurt on the way back to our accommodation after dinner. Good choices and delicious. Stopped by this little shop to enjoy a treat. Owner is excited about his product and rightly so. Very tasty and refreshing. Best soft ice (concept and taste) ever! Tried 2 soft icecreams, both with vanilla base. One of them is with coffee float and the other with nuts. They were both tasty. However, the price was on the high side on my opinion. Amazing ice cream. A neat little concept where you choose your flavor, then topping, then sauce. All local and so delicious. A must visit in Tofino! Delicious ice cream, with a choice of sauce and toppings - served by the charming owner. Try the chocolate brownie or cookie dough toppings, or a mixture! You have to do it!! Tell your friends, and go back the very next day. Its all local and its SO SO GOOD! 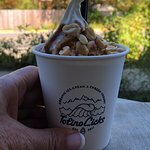 Get quick answers from Tofino Licks staff and past visitors.